A large-scale search operation is under way for Lisa Dorrian at the Ballyhalbert caravan park where she was last seen alive in 2005. Ms Dorrian, 25, disappeared after a party at the site and police believe the Bangor shop assistant was murdered. Police have pursued more than 3,500 lines of inquiry and carried out almost 400 searches. 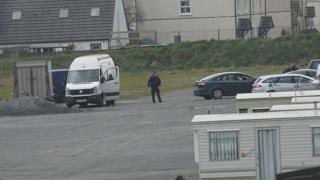 Police have not said why they have returned to the County Down caravan park to conduct the new searches. Det Supt Jason Murphy, who is leading the investigation, said: "The determination of the PSNI to bring those who killed Lisa Dorrian to justice is as strong today as it has ever been. "The purpose of the search operation is two-fold: Firstly I want to recover Lisa's body and allow the Dorrian family to finally put Lisa to rest. And secondly I am looking for evidence relating to her disappearance."